The following fees will apply to the tender value ranges for each eligible category per construction firm. Construction firms registering for the first time shall pay a registration fee together with a subscription fee including administration fees. 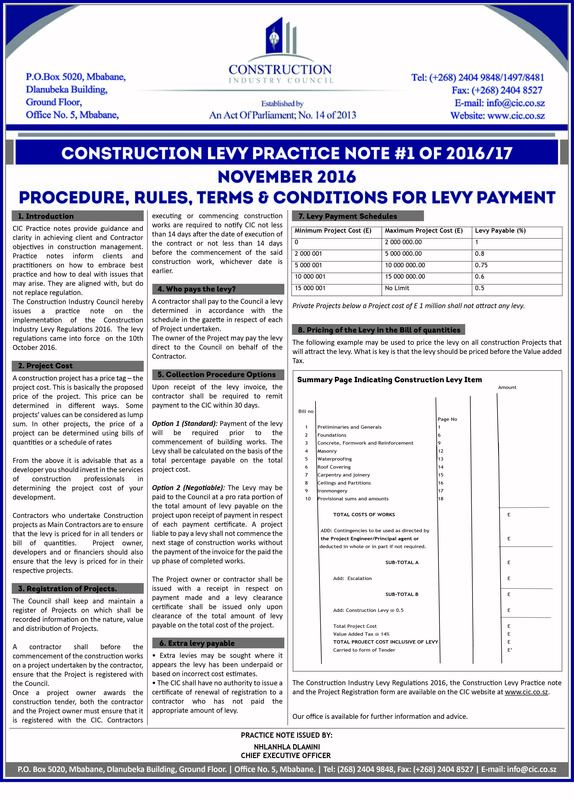 Registered construction firms shall pay an annual subscription fee yearly including the administration fees. NB: Foreign Contractors may only tender for contracts above E120 million or only where a specialized skill is involved. NB: Foreign Contractors may only tender for contracts above E200 million or only where a specialized skill is involved. NB: Foreign Contractors may only tender for contracts above E40 million or only where a specialized skill is involved. NB: Foreign Contractors may only tender for contracts above E60 million or only where a specialized skill is involved. NB: Foreign Contractors may only tender for contracts above E100 million or only where a specialized skill is involved.